Do you remember the movie Cocoon? It was a popular film released in 1985. Directed by Ron Howard, it tells the story of a group of elderly folks who have a close-encounter with aliens when they find a swimming pool filled with strange pods that possess magical powers. By jumping into the pool and swimming, these octogenarians’ tired, worn out bodies are invigorated with youthful vitality. Wouldn’t it be great if there were a way we could quickly “recharge” our own body from time to time? Introducing Intravenous Vitamin/Mineral Therapy from Guyer Institute. “What is IV Therapy,” you ask? 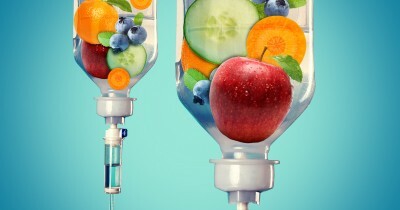 IV Therapy is a way to introduce high doses of vitamins, minerals and other nutrients directly into the bloodstream, bypassing the digestive system. John Myers, MD, a physician from Baltimore, Maryland, pioneered the use of intravenous (IV) vitamins and minerals (aka the Myer’s cocktail) as part of the overall treatment of various medical problems. We are able to bypass the GI system by placing the nutrients directly in you bloodstream. This helps avoid the normal digestive process of the stomach and intestines, which can render these nutrients inactive due to poor intestinal function. Many people plagued with digestive problems find they can tolerate IV supplementation much better than oral supplementation. Higher blood levels of the nutrients can be obtained. These increased levels can provide an immediate therapeutic response as deficiencies arising from a diseased state are corrected. If you think IV therapy might help you, give us a call. A consultation will determine whether or not such therapy is recommended. And if it is, we guarantee you won’t have to jump into a swimming pool filled with strange pods to regain a more vigorous, healthy body.